One of my photos will soon be traveling around the north, in a rather big way. 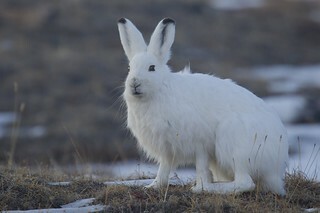 This photo of an Arctic Hare that I took this spring was bought by First Air. In about a month's time it will be put up on the tail fin of one of their ATR-42 turboprop passenger planes traveling on routes in Nunavut. The Saint George's Society Cliffs are one of my favourite places out here. Spectacular red vertical cliffs that jut 600 feet out of Adam's Sound, they are right around the corner from where I live. This time of year we are often found standing below them on the sea ice, especially at the Gyrfalcon aerie tucked into their face. This photo from last year will give you a bit of an idea of scale (note Dave Brosha on the ice). They are a crumbly cliff. Thousands of years of freezing and thawing cycles annually drive wedges of ice in cracks, popping rocks off that tumble down the cliff landing far out onto the frozen sea. Often, especially after the sun circles away from the cliff face, you can hear or see rocks come loose and bounce down the face and out onto the ice. In 2008, I wrote about a rock fall that happened in between visits, hours apart. Leah tells me a story about her grandparents camping across Adam's Sound from cliffs and watching part of the cliff face give way and smash into the ice, sending a huge splash up in the air, visible from some 5 to 10 kilometres away. If I was taking a guess I would think that rock came from where the Gyrfalcon aerie is. The cliff face is scooped out there, and looks less weathered than the surrounding rock, greyer. I was last out there the Sunday before last, and made plans to go this weekend. This Sunday was one of those glorious spring days we enjoy up here this time of year. We dog sledded in the morning and the dogs had an incredible run. It is something to watch them, especially at the start when they hit 20 mph. It is impossible to wipe that smile of Travis' face. In the afternoon, we joined much of the community, and several dog teams out at the iceberg for tea. Breaking one of the fundamental rules before heading out, I didn't check the camera battery, or put a spare in my pocket. A wonderful afternoon, with so many great photo opportunities it hurts. Dog teams + iceberg, yeah no potential there. But while there a friend who just got back from a short holiday asked if I'd seen the landslide at the cliffs. I hadn't and he pointed at the cliffs some 15 kms away and said "you can see it where that white strip is". Sure enough, a light streak marked the cliffs where none had been. We headed home, Travis joining one of the dog teams for a ride back on the qamutik. He will one day return the favour, passing along his growing skills with a dog team to some starry eyed youth. After supper, he and I headed out to the cliffs. We hoped to see the Gyrfalcon, and I wanted to get a closer look. Shortly after we arrived, Travis spotted one of the pair slipping away. It had been perched further away from the aerie than we'd expected and I would have missed it if not for his sharp eyes. High up on another section of the cliff, perhaps 400 feet up, we found a Raven's nest. Somewhere, hidden from our view halfway up a Snow Bunting was belting out song. But further up we found the slide. It had to have been spectacular to see. The scar on the rock reached to the top of the cliff, and rocks and what I thought was a dust field stretched far from the face, covering well over an acre. What I saw as I got closer surprised me. The rock fall had smashed through a large area of the ice, turning the nearly smooth surface into a field of small iceblocks. The dust field, was in fact the splash zone. The spray must have enormous to cover such an area. Someone standing below would not have stood a chance. As I headed further and further out to try and get the scene in my telephoto lens we made another discovering. The remains of Raven reduced to nothing but feathers. We have little doubt that it was the handiwork of the Gyrfalcons. And with that we headed for home, for with the Sun still high in the sky it was easy to forget that it was already passed someone's bedtime for school night. It may surprise some people, given where I live, that I have never seen a Snowy Owl up here. Oh I've seen them in the south, on one of their irruptions, but never up where they are a common breeding bird. But I've never travelled to where they commonly breed, and have relied on chance to find them in their travels, foraging or moving from their breeding grounds. And chance has not been kind. You see, for me, Snowy Owls are what are known as a nemesis bird, a bird that the fates seem to conspire against ones seeing it. Its not like they haven't been around, just that everyone would see one, but me. This year, due to the extremely good breeding year (thanks to an extremely plentiful year on the lemming cycle) Snowy Owls have been seen extensively in the south, as far south as Dallas Texas. A lot of juvenile birds, coupled with the crash of the lemming population meant that the birds were pretty far flung, looking for sufficient rodents to hunt. Up here, we've also seen this bounty. Well, others have also seen this bounty. At least three Snowy Owls wintered around here and succumbed. Two were killed by Ravens and a third was found dead of unknown causes. And from late winter through to now I've heard reports of at least one that has been around town. Everyone, well almost everyone, has seen it, with more frequent sightings as we've turned the corner to Spring. I've even seen video footage of the damned thing perched on a pole, taken by one of my son's friends on his iPod. Victor Bay, the dump, the road to the airport are all different spots where it has been seen. And I'd hear about it after the fact, "Did you see the Snowy Owl by the Hamlet Garage?" Why no I didn't, thanks for asking. And its not like I'm not out looking. We're out for a drive almost every evening. I make special trips when I hear of recent sightings. It just wasn't meant to be. Such is a nemesis bird. Yesterday was another glorious spring day here. Temperatures are beginning to approach (but not quite reach) zero, but the constant warm sun makes everything feel warmer. Couple that with little or no wind and that makes it all but impossible to be indoors. Yesterday we took full advantage of it. In the morning we went dog sledding out to the St George's Society Cliffs, the dogs having their best run of the year so far. The two of them live to be in the traces, their excitement when they see the harnesses come out of the porch is intense. Yesterday they ran hard and fast from the moment they took off and you had the sense they would have ran all day if we'd let them. After lunch we took our tea/coffee/hot apple cider/hot chocolate/instant something almost, but not quite, completely unlike lattes out further down the cliffs. We sat below the Gyrfalcon aeries, hoping to enjoy the bird's company. But they remained hidden from us and we were content to watch Ravens soar along the cliff face, almost brushing it with their wings. Late afternoon we decided to take another run with the machines and leave the qamutiq behind. We headed over down Victor Bay where Leah's parents are building a cabin. There was some debate about which route to take but my choice to go past the dump along the gentle valley in King George's shadow won out. As we got closer to Victor Bay I watched a Raven along the hills, and then saw another glide across my path further down. Only this one was pale. My first thoughts were that it was gull as they have recently arrived back, but the flight wasn't right. It landed on a low ridge by the frozen river and I stopped and retrieved my binoculars from behind the seat. It was an owl. Obviously one that didn't get the memo that I was to be avoided at all costs. It was a juvenile or a fairly dark female, but unmistakeably an owl. Leah had stopped and I handed her the binoculars and began describing where it was. About that time I realized my camera was hanging around my neck, and simultaneously the owl took off, disappearing behind the ridge. We headed over that way, hoping to get a better look and at least a record shot, but when we saw it again it was disappearing over another small ridge, and we decided not to pursue it further and cause it undue stress. As we turned and started off again for the cabin I'm sure a smile broke over my face. The jinx had been broken, Snowy Owls were no longer a nemesis bird. Now about those Sabine's Gulls. Almost exactly three years ago, on April 8th, 2009, I had the opportunity to photograph an unusual Raven. The Raven, feeding on some scraps of meat behind the House, was missing half of its bottom beak. An unusual site to be sure, but it seemed to be suffering no ill effects from the injury or deformity. Today I discovered just how successful the bird has been, for it has evidently survived the past three years quite nicely. We were heading out for a drive, and after dropping Hilary off at a friend's I noticed a Raven sitting on an oil tank stand. It seemed co-operative so I lowered the window and snapped a few shots. As I did, I noticed that it was Ol' Halfbeak. Here is a nice shot of the handsome bird. And here is one showing his weak chin. Nice to see him still kicking around. Sure its a photo of burning garbage. But the backlit smoke, contrasted by the Raven in flight makes it one of my favourite images thus far this year. The Arctic Hare (Lepus arcticus) population is on a high year this year. For much of the same reasons as people in the south are seeing huge numbers of Snowy Owls this year, the hares enjoyed a good breeding season. With the lemming populations high this past summer predators put much less pressure on the hares, resulting in them having a lot of breeding success. This time of year, when the hares are very active and easily seen, just how successful they are is evident. In town and in most suitable habitats outside one sees them, feeding, and fighting in preparation for the breeding season. A friend reported to me a herd of some 40-50 of them in an area not too far from here, near the old Nanisivik town site. Something I've only heard of from Ellesmere Island. So a lot of bunnies, makes for a lot of photo opportunities. Here are a couple of images to share. This afternoon, as I walked from the plane to terminal in Iqaluit I looked back to a beautiful slim crescent moon, followed in the sky by Venus and Jupiter. As the sky has deepened tonight I can't seem to keep my eyes from drifting up to them. It is a nice way to (almost) end my trip. One more leg, tomorrow, and I'm home. I've been travelling this week for work. And I have travelled the length and breadth of Nunavut, and not just figuratively. From 73° North, south to 62°. From 68°W in the east, clear across into the NWT capital of Yellowknife. It was eight days, for three and a half days of meetings. That saw me stop in all three regions of Nunavut: The Baffin, Kitikmeot and Kivalliq and seven communities including two territorial capitals. Some of the places were new to me, new pins in my mental map of Nunavut. Even though a couple of the new places, Gjoa Haven and Taloyoak, were simply stops at the airport enroute. Cambridge Bay, on the other hand was a welcoming place were we spent several days. Although I didn't get to see much apart from the hotel and the meeting rooms I liked what I saw in my short walk. I had hoped to get a chance to see and photograph some of the many Muskoxen in the area, but unfortunately they were quite far from town while we were away and time wouldn't allow it. Travel isn't always easy up here, and there were glitches along the way. But that is all part of the experience of travelling in the Arctic. I spent time with fellow bloggers, Craig, Megan and a brief visit with Tara. People I usually only get to talk with through their blogs or facebook. We had good sessions, and I once again am coming back inspired by my fellow Economic Development Officers, men and women who I hope are appreciated by their communities, because of the awesome work that many of them do. Checking in to my hotel tonight I found that I lucked into a huge corner suite, complete with a king sized bed. Alas there is no one to share it with. I miss my wife and kids. I miss home. Tomorrow, barring any of those northern travel glitches and weather permitting, I will be home. And that is where I long to be.